They have ended up in a dark mansion in the middle of nowhere with a man who means to harm them. But Sam doesn’t know how to get them out. 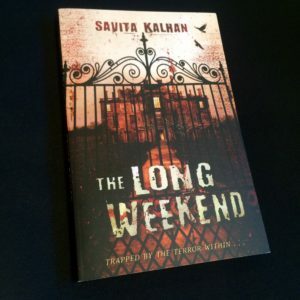 THE LONG WEEKEND is published by Andersen Press and is available as a paperback or an ebook. The Long Weekend is a dark and powerful story. It is a tense contemporary thriller about two boys escaping from a remorseless abductor. Written plainly and directly, this is all the more cogent as it is a realistic scenario – something of a cautionary tale in fact. This is beautifully handled, without a trace of sentimentality and provides a credible and compassionate ending to a harrowing story – sadly, very much of our time. those who may be reluctant to read. The Long Weekend is a dark and powerful story full of menace and fear. Savita Kalhan has managed to get inside the mind of a terrified eleven-year-old boy and realistically write about his innermost feelings of fear, anger, self-pity, and deep hatred. I would recommend this book to anyone who’s looking for an attention-grabbing thriller. It’s not for the faint-hearted. Savita Kalhan has written a horror book for young teens that is realistic and compelling.